The Number sequence Fibonacci introduced, as far back as the 13th Century has been found to have many uses in technical analysis of the financial markets today. R.N Elliott himself described "The Fibonacci Summation Series is the basis of The Wave Principle." 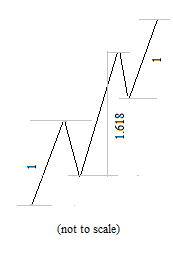 Elliot Wave trading involves using this sequence Fibonacci discovered in a number of ways. This produces the sequence Fibonacci described in relation to the mathematical problem he set out to solve relating to the breeding patterns of Rabbits. He originally set out to estimate how many rabbits there would be in a year, originating from 1 pair in a field. The Golden ratio appears in many forms throughout natural world and the importance of the Fibonacci Ratios in stock chart analysis with Elliott Wave is very clear to see. There are many ways to apply Fibonacci sequence studies to technical analysis and we also look for Fibonacci ratio relationships between the related waves in a cycle. When one of the waves extends, there are some common relationships to look for and an example of this can be seen in the chart opposite. Wave 2 is often sharp and deep. In an ideal world they would retrace 0.618 or 0.786 most of the time. Wave 4 tends toward being far shallower and will often find support at the 0.382 level. B waves are generally less consistent and tend to vary in length more but as a rule of thumb,Traders Day Trading generally looks for a 0.5 retrace in a B wave within a zigzag and either a 1.27 or 1.382 relationship in a Flat corrective wave. Have you ever given an expensive toy to a small child and watched while the child had less fun playing with the toy than with the box that it came in? In fact, I can remember some of the boxes I played with as a child that became spaceships, time machines or vehicles to use on dinosaur safaris. In many ways, Fibonacci math is just like the box kids enjoy playing with imaginatively for hours on end. It's hard to imagine a wrong way to apply Fibonacci ratios or multiples to financial markets, and new ways are being tested every day. Let's look at just some of the ways I apply Fibonacci math in my own analysis. Financial markets demonstrate an uncanny propensity to reverse at certain Fibonacci levels. 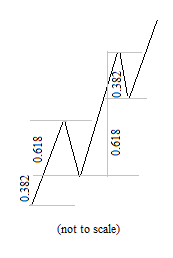 The most common Fibonacci ratios I use to forecast retracements are .382, .500 and .618. On occasion, I find .236 and .786 useful, but I prefer to stick with the big three. You can imagine how helpful these can be: Knowing where a corrective move is likely to end often identifies high-probability trade setups (Figures 7-1 and 7-2). Kennedy then goes on to explain Fibonacci extensions, circles, fans and time, using 11 charts to show what he means. Whether or not you are a math geek, you can learn a lot from this six-page introduction to Fibonacci math. Get Your Fibonacci Techniques Right Here. Jeffrey Kennedy has been using and teaching these techniques for years, and he has written a quick description of five Fibonacci techniques in his Trader's Classroom column -- now available to you for freeby signing up as a Club EWI member. Read more about the 6-page report here.